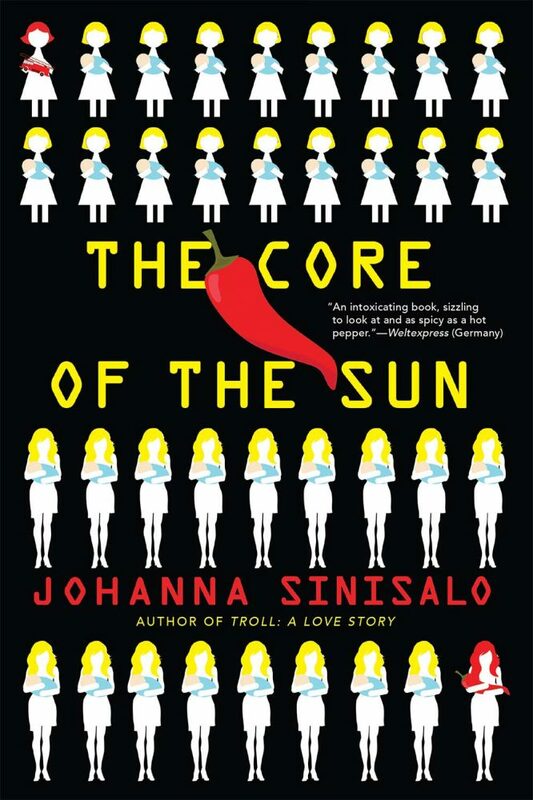 One of the most original novels I’ve read in a long time, The Core of the Sun is set in an alternative present – in the “Eusistocratic Republic of Finland”. This dystopian version of Johanna Sinisalo’s native country has been practising genetic selection, hormonal manipulation and indoctrination of its people for decades, with the aim of breeding submissive women, called “elois”, as mates for healthy men, “mascos”. Reproduction is precluded to “minus men” – those with chronic illnesses or disabilities – and to intelligent, independent women – labelled “morlocks” – whom the state sterilises. Vanna/Vera, a bright woman who passes off as an eloi, is searching for her vanished docile sister, Manna/Mira. Jare, the young man who loves Vanna/Vera, is seeking to flee abroad. But their quests are more profound than these conscious aims. Ultimately, each seeks to express an authentic, multi-faceted identity: Vera, the main character’s name before the state changed it to Vanna, means “true”. Love in its various forms – that of a grandmother, of a sister, of a man – is a poignant connecting thread in the main characters’ development. The themes may bring to mind Margaret Atwood’s The Handmaid’s Tale, but it would be a disservice to both authors to insist on comparisons. Sinisalo’s speculative fiction grows out of a strong Finnish tradition of fantasy writing. She is one of an internationally acclaimed cohort of authors writing in a diverse genre often referred to as “Finnish Weird”, but her work crosses and transcends categories. The Core of the Sun is a refreshing mixture of first-person narrations by Vanna/Vera and Jare, of letters never posted, of entries from the republic’s official dictionaries, books of fairy tales, history textbooks, homework assignments, and personality questionnaires. The extract from a 1935 article advocating eugenics is from an actual Finnish magazine, as befits a novel that invites reflection on the boundaries between fiction and real life. The translator, Lola Rogers, conveys superbly all these contrasting voices, and the main character’s complexity shines through the gradations of her tone: forthright, puzzled, sad, angry and humorous. Central to the plot – prima facie absurdly, but rendered by Sinisalo with Kafkian verisimilitude – are chili peppers, prohibited by the state; “The Core of the Sun” is the name of a fictional potent variety of peppers. This is an engaging, clever, tight, moving and suspenseful read – a true discovery. Valeria Vescina is a graduate of the Goldsmiths Creative Writing MA. Her debut novel, That Summer in Puglia, will be released by Eyewear Publishing. She is now researching her second novel, which will also be set in Puglia, but in the sixteenth century. Her teaching focuses on harnessing the narrative potential of different arts in creative writing. She reviews opera and Lieder for Seen And Heard International. Thanks for pointing the way to this novel, Valeria. I think I need to read it now.